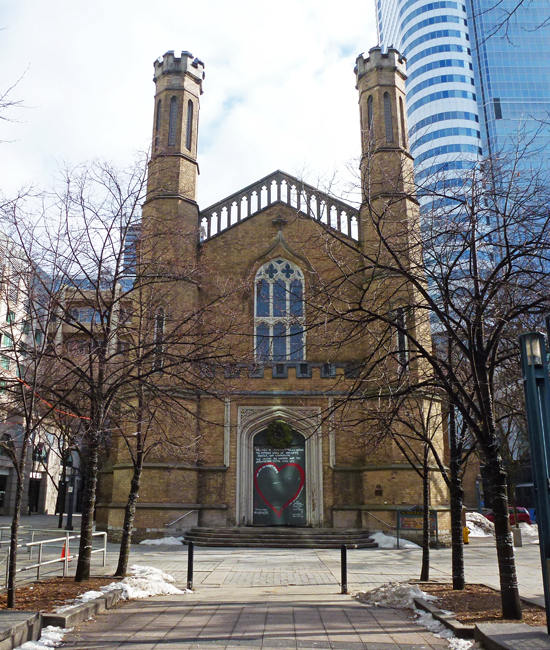 This is The Church Of The Holy Trinity which is located right downtown beside the Eaton Centre which is the huge downtown mall that is a major tourist attraction for those who like to shop. The church was built in 1847 and was slated to be torn down when the Eaton Centre was built but as a result of community outrage it was saved. It is now surrounded by a hotel, the Centre and an office tower but this view looking in from Bay St is still impressive even in winter. This is an Anglican church which has taken an active part in ministering to the homeless and needy. I will show you a bit more tomorrow. Beautiful architecture! And an important mission to serve the homeless. I am glad it was saved from destruction. It's a fine-looking structure! It looks like a place of refuge which, in one sense, is what churches are and should look like. Love the big red heart on the door and those towers are magnificent. So glad the congregation is engaged in service to the poor and needy. Seems I remember someone saying, "Inasmuch as you have done it to the least of these ... you have done it unto me." That's a little different from the so-called "evangelicals" who want to blow up the world and preach that god wants his followers to get rich and beat up on the poor and homeless. Thank goodness for that community outrage! That is a beautiful building. I've always thought that is a beautiful church, inside and outside. A beautiful church. I can't believe they wanted to demolish it and thanks to the people who felt outraged, they saved it. Voices that band together carry some weight and can make a big difference. Thank goodness that the community stood up! It is a necessary place for so many reasons! It's also a lovely building. I love it when the little guy wins. Downtown churches have struggled in most large cities as the suburbs have grown. Glad to see this historic church survive. I will look forward to seeing more of your photos. All those architectural styles. The architect of this church had a really struggle in his mind. This is a huge problem, since congregations are dwindling. People with so much are reluctant to want others to have food, clothing, shelter. Good idea to keep it, it has and a nice facade Pat !! Good for them. Hang in there, Church!